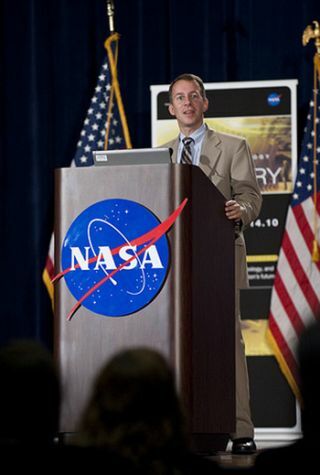 NASA Chief Technologist Robert Braun spoke at the NASA New Space Technology Industry Forum, held at the University of Maryland in College Park on July 13, 2010. During the two-day event, speakers were focused on the president's fiscal year 2011 budget request for NASA's new Space Technology Program. Representatives from industry, academia and the federal government were in attendance to discuss strategy, development and implementation of NASA's proposed new technology-enabled exploration. ADELPHI,Md. ? NASA is redoubling efforts to position itself at the vanguard of spacetechnology, with plans for ambitious new projects to spur innovative ideas fromindustry, academia and even ordinary citizens. TheU.S. space agency's nascent Space Technology Program, born as part of PresidentBarack Obama?s fiscal year 2011 budget request, is currently pending congressionalapproval. If it passes muster, the program could represent a significant pushtoward greater external collaboration and technological development for NASA. ?It?sdifferent from anything NASA has done before,? said Robert Braun, NASA?schief technologist, in a Tuesday presentation to representatives fromindustry, academia and the federal government. ?This is a competition of ideas.This is a meritocracy. We want to reposition NASA at the cutting edge.? Braundiscussed the Space Technology Program here at NASA's Space Technology IndustryForum, hosted by the agency's Office of the Chief Technologist. ? TheOCT, which was established in February, is responsible for direct management ofNASA's space technology programs, and for coordinating and tracking alltechnology investments across the agency. Braunoutlined the program, which was conceived using the Defense Advanced ResearchProjects Agency as a model. DARPA is an agency of the United States Departmentof Defense that actively develops new technology for use by the military. Byadopting a DARPA-like approach, the Space Technology Program aims to foster theadvancement of transformational technologies for futurescience and exploration. ?We?retrying to increase the pace of innovation,? said Keith Belvin, systems engineerat NASA?s Langley Research Center. ?This is a technology push ? we?re trying toget to that next technological curve.? TheSpace Technology Program incorporates 10 initiatives that fall into threecategories: Early Stage Innovation, Game Changing Technology and CrosscuttingCapability Demonstration. Thegoal at each stage, said Braun, is to provide a full spectrum of programs thatprovide an infusion path to advance innovative ideas from concept to flight. Space Technology Research Grants Program, which focuses on innovative research in advanced space technology and graduate fellowships for student research in space technology. NASA Institute for Advanced Concepts (NIAC) Program, which focuses on innovative aeronautics and space system concepts for future NASA missions. Center Innovation Fund Program, which aims to stimulate aerospace creativity and innovation at the NASA field centers throughout the country. Small Business Innovation Research (SBIR) and Small Business Technology Transfer (STTR), which would engage small businesses in space enterprise and infuse these projects across NASA missions. Centennial Challenges Prize Program, which addresses key technology needs with new sources of innovation outside of the traditional aerospace community. ThreenewCentennial Challenges were announced Tuesday as part of the forum. Researchprojects that are eligible for the Game Changing Technology stage will focus onadvancedspace technologies in preparation for potential system level flightdemonstration. Game Changing Development Program, which looks at ideas that could enable new capabilities or radically alter current approaches to space systems. Franklin Small Satellite Subsystems Technology Program, which enables small satellites to provide transformational capabilities for the government and commercial sectors. Thethird division of the Space Technology Program focuses on the maturation of asmall number of technologies to flight readiness. These so-called ?crosscuttingcapabilities? have the potential to benefit several customers and advance multiplefuture space missions. Technology Demonstration Missions Program, which matures, through flight demonstrations, a small number of NASA technologies in partnership with Mission Directorates. Edison Small Satellite Missions Program, which develops and operates a series of NASA-focused small satellite demonstration missions in collaboration with academia and small businesses. Flight Opportunities Program, which provides flight opportunities of reduced-gravity environments, brief periods of weightlessness and high-altitude atmospheric research. Ifthe Space Technology Program meets with congressional approval, the first roundof proposal requests could come as soon as October. Officials at the OCT havehigh hopes for the program?s impact on the future of NASA. ?We?relooking for investments and technological solutions to real problems,? Braunsaid. ?We?re looking for visions of the future. ?